We are offering a quality range of Industrial Agitators which are used for electrolyte dosing, lime dosing, chlorine dosing. Available in all custom sizes, these Industrial Agitators are available with MS, SS 304 and SS 316 shaft and impeller options. 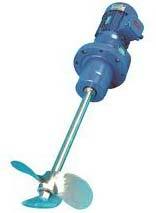 Our Industrial Agitators are equipped with crompton greaves motors for efficient and reliable usage. These motors are attached to specially made bearing housing which are fitted with three SKF make only bearing units for hassle free service. Our Industrial Agitators are modestly priced and are very easy to install. We provide its mounting frame with the agitators. Motor : 20-150 RPM Flange Mounted 3 Ph. CGL make motor with Elecon make Geared Reducer. Impellers : Pitched blade, hydrofoil and all other types of impellers are available.